Canson’s latest product, the Papershow, aims to revolutionize presentations with a new technology that offers an easy way to present without having to use a keyboard, mouse, or clicker. 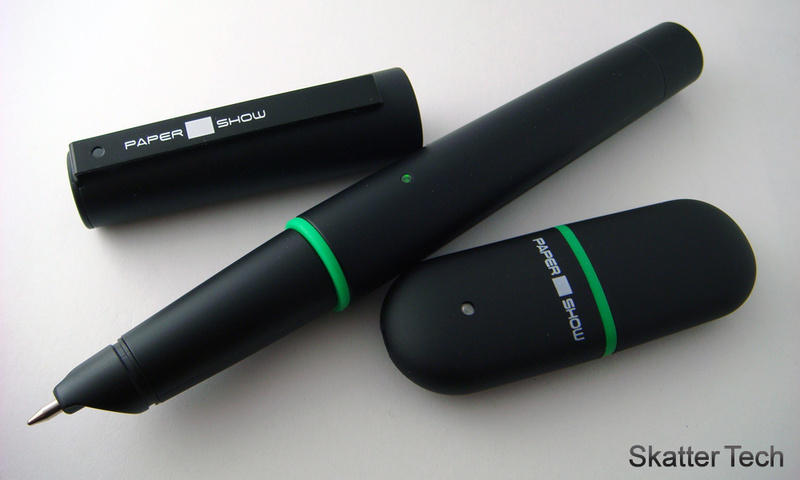 The kit includes some special paper and Bluetooth-powered pen and receiver. Once setup, the device offers the ability to present slides, images, and digital charts while editing and making changes live. Papershow essentially becomes a whiteboard using a projector and a computer controlled with a pen on paper. To get started, I popped in the AA battery into the pen and plugged the Bluetooth USB receiver into my laptop. My Windows 7 machine had some issues running the application at first, but it worked once running in compatibility mode for Vista. Since all the software runs off the device, there was no more installation hassle. During configuration, I had to choose which style paper I had planned to use, and in my case, it was the A4 notebook. The starter kit comes with both an A4 notebook of 40 pages and 30 pages of 8.5×11 inch printer paper. 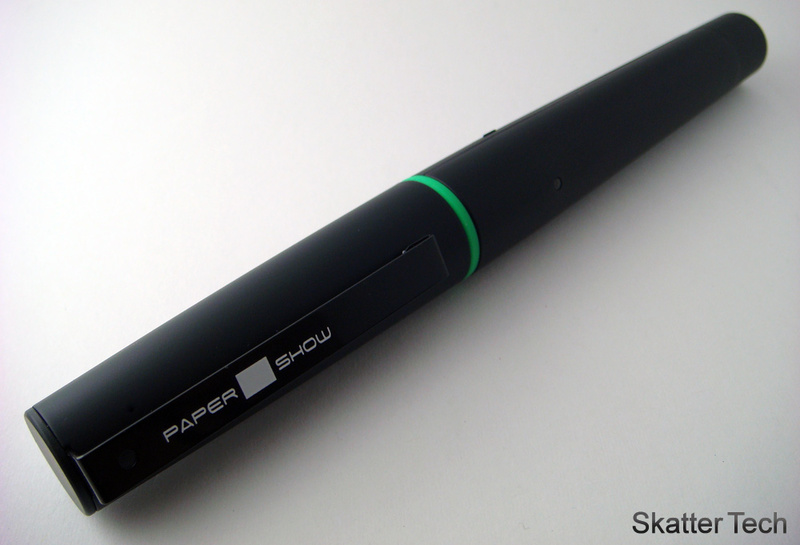 The Papershow pen will only work with this special paper. There are nearly invisible dots integrated throughout each sheet which allow the pen’s technology to detect movement and behavior. There are several icons on the side of each sheet which through a quick tap allow changing color, shape, thickness, etc. Other icons on the side allow refining the presentation with post-its, arrows, shapes, and other tools. These controls also allow editing by redoing, undoing, and even deleting objects or slides. You can also print and export your presentation for future reference. The Papershow USB receiver contains part of the brains of the device. 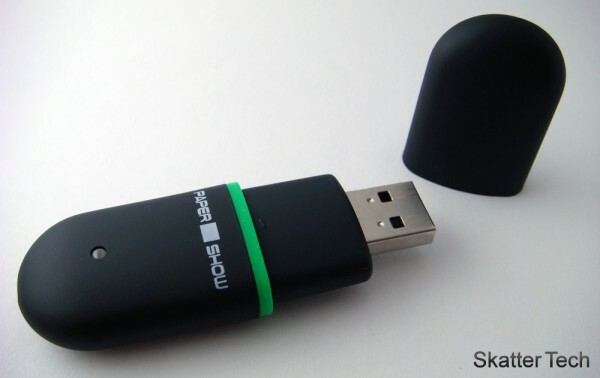 This key stores all your sessions on the 250MB of onboard flash memory. I was impressed with the responsiveness of the device since there almost no delay at all between what I wrote on paper and what appeared on the screen. The entire presentation process was truly real-time. All the function icons worked seamlessly even providing audible confirmations. I was easily able to import images, PowerPoints, and PDFs into Papershow’s software and print them onto their paper. I was then able to make modifications on these printed sheets using the pen to digitally incorporate them into a presentation. There were only a few issues I had with this product. Although I’m aware the ideal purpose of this device is for presentations, it is a bit restricting not being able to take notes without being connected to a computer. Next, I found myself quite disappointed to realize that the paper copy never ended up looking anything like what was on my screen. For example, when erasing with Papershow you’ll have scratch away at the desired areas. While it cleanly disappears on your screen, those horrendous ink marks remain on the paper. In order to create a shape in Papershow, you must draw a diagonal line on your sheet of paper. While looking great on screen, it’ll be confusing to understand when you come back to it later. In addition, I found it difficult trying to get the right shapes the first time around. These attempts left annoying trails on paper. This really isn’t a big problem as long as you understand that your sheet of paper will look nothing like its digital counterpart. Overall, Papershow successfully helps organize and improve your presentations. While businesses are constantly on the look out for innovative ways to communicate, this device finds its place. It’s a user-friendly device with a quick learning curve. The Papershow serves many purposes, including the ability to create or modify documents in an interactive way. The product will unfortunately set you back around $200 for the starter kit. Keep in mind you will also have to buy Papershow’s notebooks and printer paper when you run out. 200 sheets of 8.5 x 11 inch printer paper costs $20 and 48 sheets of A4 9.4 x 12.6 inch sheets cost $15.00. That’s quite expensive considering a ream of 500 sheets of regular printer paper costs under $10. With that said, it’s still a neat alternative to using whiteboards and overhead projectors. It’s definitely a new kind of product that’s worth purchasing to make presentations a much more manageable, interactive, and an enjoyable process. Please note that when PAPERSHOW is initialize that you should always choose the Letter format, even if you are using the A4 Notepad. SO if you are in the US or Canada, please choose Letter size paper with the CANSON logo when you initialize the key. The printer paper is used for printing your PowerPoint presentation or pdf images on AFTER it is imported onto the Key. If you choose the A4 format and try to use the 8.5×11 printer paper you will get an error message “You are writing on the wrong paper”. For more info visit http://www.papershow.com. The comment in the review about beginning with the A4 notepad was related just to which paper I was using to work with the Papershow software. Thank you for the clarification, because as you said it will not work correctly without selecting Letter format. Well, I’m trying now this product for our company. And I see a lot mess with paper formats. I have A4 format paper for printers, and when I print on it after import, changed to Letter format, it program says that wrong paper. but how to change format in this software? Because via upgrade window place where you can change it it is grayed(N/A)…..